"The Sprite Project: Satellite on a Chip"
ABSTRACT -- STS 134 carried a very tiny payload to the International Space Station: three spacecraft-on-a-chip prototypes called Sprites. They use about 1 square centimeter of solar cells to power a microprocessor and radio that communicate with an inexpensive HAM antenna on earth. The point of this experiment is to validate the architecture of a spacecraft the size of a coin, one that might weigh at most 50 mg. If the Sprite project is successful, we could see an entirely new generation of spacecraft: trivially cheap to launch into earth orbit, capable of measuring the physics of large-scale phenomena such as solar storms, and even able to travel to distant locations without propellant. This last feature may be surprising, but it's the result of small-scale physics. Solar pressure is enough to push Sprites around the solar system. Sprites may also use the earth's magnetic field for propulsion. Attitude-control solutions for these tiny devices is also surprising. But what would really change the game is to shoot these little explorers out of a particle accelerator, giving them a velocity approaching the speed of light. Dr. Peck will describe this project and will bring some hardware to pass around. He is also looking for new ideas: what would be an effective way of getting Sprites into space without resorting to a large launch vehicle? SPEAKER -- Zac Manchester is a Ph.D. student in Aerospace Engineering at Cornell University with an interest in small spacecraft and a passion for expanding access to space. 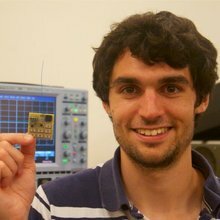 For the past several years he's been working on the Sprite - a prototype spacecraft-on-a-chip device capable of collecting sensor data and communicating with ground stations from low Earth orbit. Zac earned a a B.S. in Applied and Engineering Physics and a M.Eng. in Aerospace Engineering from Cornell. Next Week: No Colloquium: Happy Holidays!